At A E Skin, Dr. Alex is committed to continuing his education to better serve his patients. As with any job, there are always new things to do and learn, and the field of cosmetic medicine is no exception. It seems like every day there are new devices and products available for new things. This is why Dr. Alex is commited to continuing his education by attending workshops, seminars, and trade shows. Dr. Alex is a regular at the American Academy of Dermatology conference and The Aesthetic Show, and A E Skin won the award for Best Aesthetic Practice at the 2014 Aesthetic Show in Las Vegas, NV earlier this year. 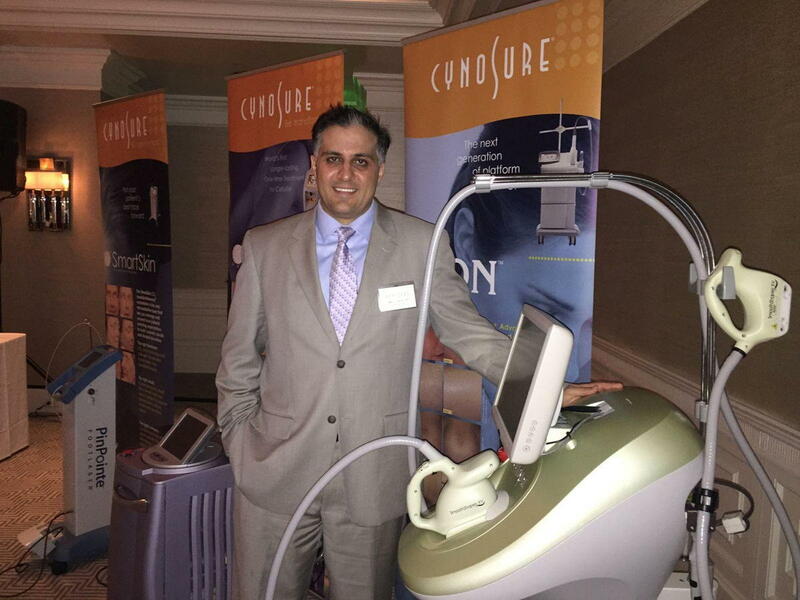 This weekend, Dr. Alex attended a workshop by Dr. Stephen Mulholland of Spa Medica sponsored by Cynosure lasers (maker of Smart Lipo) and Allergan (maker of Botox, Juvederm, Latisse, and Voluma), where he learned about the newest devices and injectable techniques. Dr. Alex takes time off from work to attend these sessions and averages over one day per month for such educational activities. This learning through educational workshops has led to A E Skin being able to provide more products and services to our patients. Some of the more recent products now available include the Elta MD UV Daily Tinted sunscreen which provides hydration for those with dry skin and the MD Solar Mineral Tinted Creme sunscreen for those who prefer a matte finish. These seminars led Dr. Alex to develop the wildly popular and now famous A E Skin Soft and Smooth Rejuvenation treatment (video testimonial 1, video testimonial 2, video testimonial 3) and the A E Skin Ultimate Rejuvenation treatment (video testimonial 1, video testimonial 2). In the past twelve months A E Skin has started offering new services including Juvederm Voluma, Ultherapy, and Freeze the Fat. Voluma is a popular injectable product providing volume to the mid-face which lasts two years. Ultherapy is a treatment that uses the power of ultrasound to deliver focused energy to the deep layers of the skin to provide a lift without downtime or surgery. Freeze the Fat (Cool Sculpting by Zeltiq) is a non-invasive body contouring device which cools the skin and allows the body to naturally eliminate stubborn fat. Some possibilities for the future include microdermabrasion, high speed laser hair removal, and tattoo removal. Please let us know if you are interested in anything we do not currently offer. Check out some of the new treatments now available if you have not been in for a while. Contact us for a free consultation with Dr. Alex.